* what leads to a good economic outcome? * global neoliberalism and the free market culture.
"" Global Economy, Global Justice should be quite useful for upper-level undergraduates or master's level courses in international relations and the global economy." "This is an extraordinarily creative and comprehensive book. It traces the theoretical roots of the current widespread celebration of the market, offers an alternative perspective that can far better serve the campaign for global justice, and provides a series of concrete policy reforms to promote global equality. Any one of these accomplishments is significant and much needed. Together, they offer a masterful synthesis as well as a provocative call to action one that must be heeded by proponents and critics of neoliberalism alike." "George De Martino has written a fantastic book! It is simply the best available analysis of the neo-liberal package of ideas, which have so far guided (and deformed) globalization. 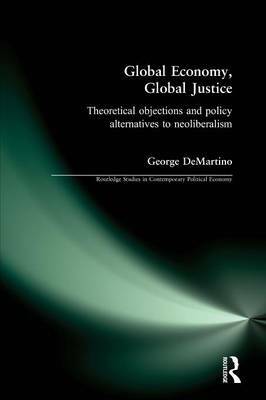 By offering lucid criticism and alternatives, De Martino also offers readers an excellent perspective on global economic reform." "When all the hype surrounding globalization finally settles down, it is books like Global Economy, Global Justice that will prove most influential. DeMartino has put the phenomenon of globalization in philosophical and political perspective, without presuming that his own views are "value free." The book also provides some creative solutions to the ethical dilemmas raised by globalization. I strongly recommend Global Economy, Global Justice for anyone seeking abalanced perspective on the rapid changes occurring in the world economy today."